The Los Angeles Kings roller coaster of a season continues this week. After winning eight straight games and climbing back into a playoff spot in the Pacific Division, the Kings lost their last three games and have allowed the Calgary Flames to pass them in the standings. Over the last few seasons it’s become normal to see the Kings go through these up and down stretches. The same goes for their best player, Anze Kopitar, who has become a model of inconsistent play. When Kopitar is playing well he’s one of the best centers in the game. A physical player with soft hands and good vision, who can dominate a game offensively. Kopitar, a runner up for the Selke Trophy last season, is also one of the best defensive forwards in the game. As good as Kopitar can be, he is notorious for disappearing for long stretches of the season. This season Kopitar has gone cold more often than normal. If Kopitar continues his current scoring pace of 60 points for the season, it’ll be his lowest total for a non lockout season. This could also be the first time Kopitar has a negative +/- since ‘08-’09, which was also the last time the Kings missed the playoffs. The last few years, Kings fans have grown frustrated with Kopitar’s lack of shooting. For three straight full seasons Kopitar’s shot totals have dropped and unless he starts shooting like Alexander Ovechkin, he’ll have his lowest average shots on goal this season. Through 59 games, Kopitar has only 97 shots on goal, and is on pace for only 16 goals. Kopitar has never had less than 20 goals in a full season. 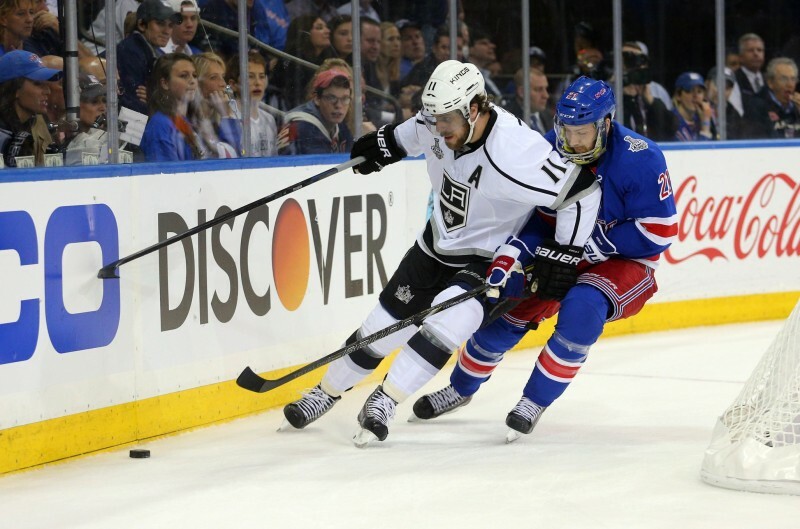 Are Kopitar’s Linemates Hurting His Game? Kopitar has spent the bulk of this season centering Marian Gaborik and Dustin Brown. Brown has played with Kopitar for several seasons now, and the two have had decent chemistry for most of their time together. While he’s always been known as a hard worker, Brown doesn’t have the skills to create a lot of space for himself and needs a creative player, like Kopitar to open things up for him. Brown’s play has dropped off in recent years and he’ll probably never be a 30 goal scorer again, but he’s actually on pace for more points than last season. The goals might not be coming for Brown, but his shooting percentage is the lowest of his career since his rookie season at only 6.5%. It appears that Brown is playing better than last season and perhaps is having some bad luck with scoring. Last season’s trade deadline acquisition of Marian Gaborik paid huge dividends for the Kings, as he led all players in goal scoring during the playoffs and helped the team to their second Stanley Cup win in three seasons. Gaborik has always been fragile, and this season has been no exception, as he’s sat out several games due to injury. When he’s healthy though, Gaborik is averaging .35 goals per game, which over a full 82 games would put him just below 30, where you would expect a player like him to be. Gaborik has also been the only positive +/- player on the Kings first line this season at +4. With both Brown and Gaborik seemingly playing on par with their recent seasons, it indicates that the biggest problem with the Kings first line right now is Anze Kopitar. Kopitar is still one of the top five forwards in Corsi for Percentage during Even Strength 5v5 situations. This means that while he’s on the ice, his team is getting more shots on goal than normal. However, Kopitar himself is not shooting the puck. Given that his shooting percentage is 12.4%, good for fifth on the team, there is little reason for him not to be shooting more. Currently, Dwight King and Trevor Lewis are outshooting Kopitar this season. Two players of their caliber should never be outshooting your team’s top center. Kopitar Needs to Improve For Kings to Make the Playoffs. So far this season Kopitar has been one of the three stars of a game only seven times, and the #1 star only twice. Both of those #1 stars coming the last week of 2014 when he was the NHL’s #1 star of the week. For someone who’s expected to be your best player on most nights, this is not good enough. During the Kings recent eight game winning streak Kopitar averaged two shots on goal per game. In their recent three game losing streak, Kopitar has one shot. The last two games have been against a divisional rival in the Anaheim Ducks, and the Winnipeg Jets, a team the Kings are in a wild card spot battle with. Those are the type of games you need your best player to step up in. Kopitar has step up in those games. This season Kopitar has failed to get a shot on goal in 10 games – the Kings have lost all 10 of those games. Kopitar needs to start finding ways to generate more offense.